You are here: Brookfield Primary School → Curriculum and learning overview → Curriculum subjects → R.E. Children receive regular R.E. lessons which focus on topics that cover the major world faiths, aspects of Christianity and how religion impacts on people’s everyday lives. During their time at Brookfield, children will study all the major world religions and visit key places of worship such as St Paul’s Cathedral, the Regents Park Mosque and the Neasden Temple. Links are made with other topics / subject areas and children are encouraged to become caring and responsible citizens through the buddying systems, involvement with the local community and fundraising for charitable causes. 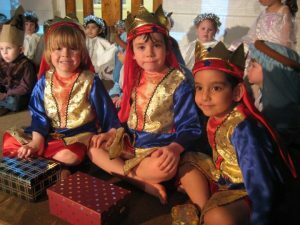 Key festivals are covered in assemblies and there are opportunities for children to reflect, explore and celebrate their cultural diversity in assemblies and through whole school events such as the International Evening.